StyleWriter 4 editor software checks 10,000 words in 12 seconds for hundreds of style and English usage issues like wordy and complex sentences, passive voice, nominalization, jargon, clichés, readability, spelling, etc. Go to Tools - Options - Spelling and Grammar. Make sure that “Show Readability Statistics” is ticked. Then select the text you want to test and select Tools - Spelling and Grammar (or click F7). The dialogue box will ask if you want to check the remainder of the document. 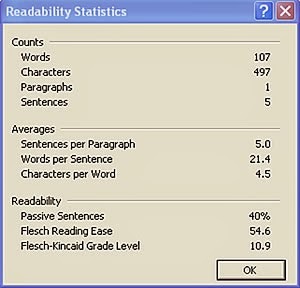 Click “no” and you will see the readability statistics. For more information about the Flesch-Kincaid and other readability formulas, please read “The principles of readability” by William DuBay. Why should you, as legal writers, aim for a reading level of 8th or 9th grade (or below)? (a) Time Magazine articles are written at the 9th grade level. 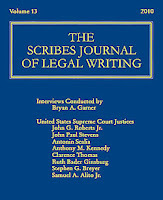 (d) US Supreme Court justices want their decisions to be understood by ordinary people -- Bryan A. Garner’s 2010 interviews with US Supreme Court Justices, from Scribes Journal of Legal Writing Volume 13. I’d love one day for someone at a gas station who is not a lawyer to come up to me and say to me, “You know, I read your opinion, and I don’t agree with you.” Wouldn’t that be wonderful? “I’m not a lawyer, I read your opinion, I understood it, I don’t agree with you, but thanks for making it accessible.” So we talk of it in terms of accessibility. If an ordinary person who is not a lawyer can understand it, I think that gives weight to what the Court does, and law is supposed to be intelligible. They should be able to follow it without having to take special vocabulary courses. And the purpose of an opinion is to give your reasons, and you give your reasons both for guidance, but also it should be possible for readers to criticize the writer. Now, people can’t criticize what I say, they can’t explain why they think it’s wrong, unless they can understand. Simply write or paste text you want to analyze (up to 500KB in size) and this website’s free text analysis tool will give you statistics on word count, unique words, number of sentences, average words per sentence, lexical density, and the Gunning Fog readability index. More detailed statistics are available to members.